In the same manner of the PGSM 30 Day Challenge, Artemis and Small Lady have come up with a 30 Day Myu challenge! The Myu 30 Day Challenge has been posted to our tumblr! You can follow the challenge there with the tag #gcmyu30day and if you choose to do the challenge on your own tumblr, make sure to tag your posts! If you don't want to do it on your tumblr, you can simply post each days question here in this thread. These members can collect this shiny bumper to commemorate their effort!
! I forgot about this. >.< Would it be okay if I started doing this challenge now? I got into Myu thanks to GC! After hearing about Myus and reading posts in some of the topics related to them, I was convinced to check out the performances, and listen to the songs. And boy did they surprise me positively! I started doing this on Tumblr a couple weeks ago and got about three days in, but ended up losing track of things due to a convention, the unexpected bout of con plague after that, and various other distractions. So I'll copy and paste what I've got there so far and try to keep going in both places after that. Day 1 - What was your first Myu and/or how did you get into Myu? The very first musical I watched was the original Kaguya Shima Densetsu just last August. It was about a week before I was set to fly out to Power Morphicon, where none other than Yuuta Mochizuki himself was going to be a guest (and if you must know, I was planning to go long before he was announced for it—I’m also a big Power Rangers/sentai fan), and after watching Zyuranger (the reason he was a guest) and crushing on his character in that so hard, I remembered reading that he was in the musicals. And as it was, I’d been meaning for the longest time to check them out, just because I’ve been a Sailor Moon fan since it first came to the US. So I started hunting around for one that he was in. This happened to be the first one I found. As soon as Space Knight appeared, there was no turning back for me. I was hooked. And I wanted more. Uhhh, this sounds like fun! I'll do this, too! So before I joined GC, I always read the posts from a tumblr blog (silvermoon424) since I really liked her analyses (funnily I don't even have tumblr xD). And some day I saw a post don't know if it was reblogged or her own, whatever xD on her page with a list of someone's hers or another one's favorite Sailor Moon songs. I looked up every song I didn't know and suddenly I came across a musical song - "Solar Miracle, Make Up!". That was the first time I ever saw a sequence of the musicals. Time went by and eventually I joined GC. When I introduced myself here I got the recommendation that I should watch the musicals (thanks to Seren, Miss Moon Rose and Batgirl xD). And so I thought: Hey, why not? There's nothing to lose. Later I texted Small Lady, told her that I really liked what I saw and finally asked her which one she would recommend to watch next. And that's how I got into the Myus. 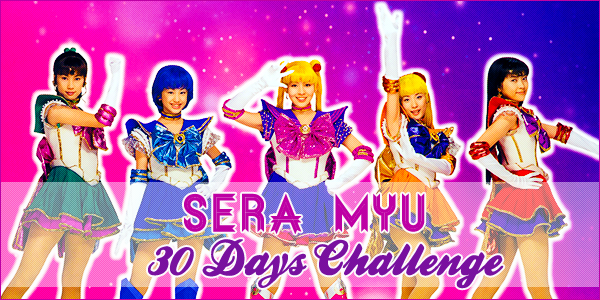 Day 2 - Is Sera Myu your favorite version of Sailor Moon? Why or why not? Since getting into them last summer, I think it’s safe to say that they indeed have become my favorite version. A lot of people will complain about the body proportions in the manga or either version of the anime, but you won’t find that here, because they’re real people! Not only that, but the shows based more on the specific arcs manage to make things concise and easy to follow, all while adding new and interesting things to the story and universe and even building on it by creating all-new adventures. Where else in the Sailor Moon canon can you see our heroines performing in a circus or battling vampires, or see Galaxia and Queen Beryl working together? And of course, the songs make the musicals that much more memorable too. The music is great. It manages to adapt very many different emotions and genres, which makes it memorable. Many of the performers are very good in their roles, which just adds more charm into Myus, and I love the twists Myus included in the canon timeline stories. They always manage to make the stories feel different from their other counterparts (anime and manga), so you are not sure what will happen, or how. Some things are added and expanded, while still managing to tell a complete story arc in just few hours. Not even speaking about the original stories or characters! Kaguya is my favorite arc nowadays, and the Dracul saga ranks second, which just shows how well Myus pulled off the original stories without making them seem like something that doesn't belong in SM. In my opinion, that is. And most Myu original characters are diverse and interesting. Some of them are among my favorite SM characters. Day 3 - Favorite musical(s)? Eien Densetsu Kaiteiban for sure, both the regular version and the senshuuraku (final day performance). It’s an incredibly well put together story that will have you laughing your head off all throughout the first act (especially the senshuuraku with all the wacky ad-libs), and then make you burst into tears in the second act. The cast is about as perfect as you can get as well, with virtually all of my favorites in this (Anza and Yuuta are my favorite Moon/Tux combo with such extraordinary on-stage chemistry that was very much on display here), and it was a joy to see some old favorite songs make a return here in Gondola no Koibito-tachi from S and everyone joining in for Double Moonlight Romance from SuperS at the end (and if the senshuuraku version of this doesn’t make you cry and/or want to hug everyone at the end, you have no soul). My second favorite would probably be Kaguya Shima Densetsu Kaiteiban. The original may have a special place in my heart for being my first, but the revision tightened things up story-wise and made some additional changes that made it that much more enjoyable. And again, it had some very good casting. Oh yeah, and we get a whole extra scene of King Endymion in a frilly pink apron that wasn’t in the original. How could you not like that? But I really liked Eien Densetsu/The Eternal Legend because I looooooooved the story idea. Come on, Beryl and Galaxia unite and fight together? That's just awesome! And that's what I love about the musicals. They do their own thing and make a new story out of an old one. And they do it perfect! So yeah, these two are really great! Day 4. Least favorite musical(s)? La Reconquista. I don't know, it didn't knock my socks off. I didn't laugh, I didn't cry. Was just sitting there like "Well, okay" xD Only during the last 20 minutes it was slightly thrilling. There are two things but I think they're both quite obvious. my first myu was I believe Eien Densentsu I know it was a stars musical and it had Sanae in it but i do believe that was my first. how i got into it was I as looking for PGSM zoisite video's when I came across Destined couple at first I just thought it was really good cosplay until I actually started watching the video I dd a bit of research and learned more about myu and than I actually started watching one of the first stage musicals While i had liked Sanae I do remember thinking "she's pretty good but that other one was way better" I've been watching for long enough now that it's strange to think that at one time I had no idea who any of these people were. Good question, next question! xD No honestly, there is nothing about the Myus that I don't like. Well, sometimes I didn't like the cast - or rather single actors - and in some musicals I really didn't like the costumes but otherwise...nothing I really disliked. This is late, so I’m doing these two a day until I catch up. As I mentioned previously, I love the story of the Kaguya musicals, and so Shin Kaguya and Kaguya Shima Kaiteban are my top favorite musicals. The music in both musicals is awesome. Minna Dareka ni Aisarete and LINK are some of my top favorite songs from Myus, and I especially love many of the beautiful new tracks from Shin Kaguya that were composed much later than original Kaguya’s tracks, and still work together seamlessly with the older tracks. Ice Doll, Junketsu no Narcissism, Moonlight Justice, Haha no Ketsumyaku and Toraware no Artuka would be my top favorites from those. The choreographies, especially Shin Kaguya’s, are also very entertaining to watch. Kaguya Kaiteban has my favorite overall cast of all Myus, and so many actresses/ actors have great chemistry with each other. I love this group of Inners, and Outers alike, and you can’t go wrong by casting some of Myu’s most popular performers in vivid roles. In Shin Kaguya many cast members have grown used to each other, and even when that’s not the case, they too have good dynamics with each other. And don’t get me started on the original story and characters. There’s just something I love about them. I loved seeing more of Merrow’s group and Artuka’s history in Shin Kaguya since the idea and timeline of the Artuka Kingdom fascinates me, not even speaking about the characters. The villains, especially the Jewel Ladies (nickname by Verdi/Pluto) in the original are great characters, too. And there are a lot of emotions - both sad and fun. The humor and jokes in Kaguyas gets me every time, and it’s better to prepare yourself for the sad scenes. Speaking of emotions, Eien Densetsu Kaiteban also ranks high on my list. What an amazing ending for the First Stage! Since I’m only talking about the old Myus, Mugen Gakuen Kaiteban and Dark Kingdom Fukkatsu Hen would be my least favorites. I don’t feel like either of the musicals carries the story as well as the others do. I wish Gaiden was longer, so it had the opportunity to expand the story a bit, since as it is, it feels short and at times rushed. As for Mugen Gakuen Kaiteban, its plot is more tight-knit than the summer version’s, but I don’t feel nearly as big of an emotional load in the Kaiteban, plus few cast members are not yet into their roles, so the musical is low on my list. This isn’t to say either of the musicals is bad, though. It’s just that for me, when I compare them to the others, they rank lowest. Whoops, missed a couple days here. I'll just keep going one day at a time anyway. Day 4: Least favorite musical(s)? In general, the casting was not very good. Few of them really fit the role, and it was clear from the get-go that Yuuta Enomoto (Tuxedo Mask) did not want to be there. Fumina deserved a better partner (and she fortunately got a better one after this). The only ones who really saved the show from being a complete disaster, in my opinion, were the returning cast in Hikari Ono returning to the role of Hawk’s Eye, Yuri Nishina as Queen Beryl once again, and Yuuta Mochizuki making the logical jump up to King Endymion (as well as becoming the action choreographer). It’s little wonder why they’re all perennial fan favorites. There's only one thing which bothered me and which I always wanted to change: the costumes xD The costumes of the newer musicals look great, undoubtedly. But the older costumes...I really disliked some of them. And what is with this prop? It's too hard to pick just one thing, so I am going to agree with Princess Moon and say originality + twists, and the music. The music is so diverse and combines many different genres. I dare say there is at least one song for anyone, even if you are not a fan of the Myus. The songs are catchy and express a variety of emotions and themes. The style of the songs even changes a little depending on the musical, while still managing to hold on to the core of Myu music. This is a hard one. There isn't much I dislike, but if I had to pick one thing, it's probably some single actresses, or rather how they don't fit the roles they were given. There are some who I think would have been very good in another role than the one they played. My favorite Moon is Anza! For me Anza plays Usagi the best. She shows her silly, klutzy side as well as her sometimes serious, emotional side. And I also think she is a very good singer. When I compare her with other Moon Actresses - for example with Satomi Okubo from the newer musicals - then I think Anza is a better actress. During La Reconquista Satomi mostly only showed the silly Usagi and not the other side of her and this kinda bothered me. Her singing is not as good as Anza's either, she has a very thin voice. But Anza's not only my favorite because she has a good voice...no, it's more because she gives me feelings. Let's go back to my comparison example Satomi xD When I watched La Reconquista I didn't feel anything. I didn't laugh, I didn't cry - I just sat in front of my laptop, no more, no less. But when I watched Eien Densetsu I was really sad, I felt really bad for Usagi when she lost her friends during the battle against Shadow Galactica. Anza just got more through to me. Marina is a good Moon, too. She was also able to make me feel sad or happy - like Anza. But I prefer Anza's voice to Marina's, so that's the reason why my #1 is Anza Ooyama! And of course, there's all the fantastic and memorable music in all the shows. I've loved La Soldier and the single version of Sailor War since long before I'd even watched a single musical, and they still hold up well now. It's really hard to say, because I enjoy them so much, but sometimes I feel like the "silly" scenes drag on a bit too long. I know that at least in those early years, they wanted to keep the spirit of the anime and some its wackier moments, and they wanted to keep the younger audience members engaged too, but they don't always contribute a lot to the ongoing plot. This is something that I'll probably hit upon more in the next one, but it kind of bugs me how they often didn't have the full cast do some of the closing numbers and it's just the Senshi. I know that's who the audience is really there to see, but when the rest of the cast has some really talented people as well, it would be nice to see them have their moment to shine with the rest of them, you know? I went out yesterday, so I missed posting here @_@ Well, now I'm a day behind but I think it's no problem - I'll continue with one post per day like before! Well that's a hard one since we don't see that much from the Inners (at least not in the musicals I saw - maybe they had a bigger role in some other Myus, don't know xD). But I really liked Rei's and Minako's actresses from Eien Densetsu. Misako Kotani played Rei so good, she often reminded me of anime Rei! So tough, so ambitious and she didn't put up with anything. I always liked how fiery Rei was in the anime, so I was glad to see a bit of this in Eien Densetsu. I know I haven't been participating but its really fun reading everyone's responses. So I'll keep lurking and reading for now. Day 7: If you could change one thing about Myu what would it be? As I hinted at for Day 6, one thing I’d have changed would be more closing/encore numbers with the entire cast as opposed to just the Senshi. I know the Senshi are who the audience is really there to see above all else, but it sometimes feels unfair to the often very talented cast members who aren’t one of them. The rare times we do get to see everyone singing and dancing together, such as in the first S musical with La Soldier or Sailor Stars Kaiteiban with L’amour D’amour Moonlight, are just so much fun. Even Eien Densetsu Kaiteiban with its version of Double Moonlight Romance counts for me, because everyone gets to be involved, and everyone gets to shine together. And as something entirely unrelated to the above, but that I would also count as both something I wish I could change and a thing I don’t like is…well, some of the general fandom attitudes towards the older musicals. From my perspective, many Sailor Moon fans will talk favorably at great lengths about the newer ones but will either trash the original ones or pretend they don’t exist, and that’s if they’re even aware of their existence in the first place. It’s fine if you like the new ones--I haven’t seen them yet myself and don’t feel particularly compelled to do so for a variety of reasons--but at least show the original musicals from the ‘90s and early 2000s some respect. They’re just as much a part of the greater Sailor Moon franchise as La Reconquista and Petite Etrangere (and whatever the next new one will be called) are, and without them, you may not even have even had these current ones. ^ I agree with you. It’s sad many don’t consider Myus an official version of SM. I know Myus are not everyone’s cup of tea, but I recommend everyone to give them a chance. There’s a lot to love about them. And do join us, Brit! More spotlight time for Makoto/Jupiter. I feel the other Inners have much more individual moments than what Makoto got, and there's a lot of potential for her. She's a great character who deserves more screen time than she got. The other one would be to make some of the joke scenes shorter. This fully depends on what jokes and Myus we're talking about, though. For example, I personally find Last Dracul's impostor scene very funny, but I don’t like the Death Mannetjes' joke scene with just the four of them. Like Khandri said, some of the scenes drag on too long, specifically in the first years of Myus. Can I just say all four of them? If I absolutely had to choose, I would say Miyuki, but all four have such wonderful portrayals of Usagi, all different and unique. Anza’s the most experienced singer of the four, and her portrayal is close to anime!Usagi. Her way to execute sad emotions makes the scenes very impactful. But I also like Fumina’s more elegant, manga!Usagi-esque portrayal. She nailed it without seeming too serious (just look at her funny scenes in Kaguyas), even though her start as Usagi was the hardest one thanks to First Stage just ending. Miyuki is, to me, like Usagi would be in real life, and her acting was spot on from the very beginning. And Marina grew the most with her role, it’s amazing when you compare her first musical to her last one and see how much she developed as an actress. Also, I think Miyuki and Marina nailed Usagi's cute side very well. 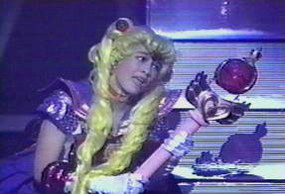 For the longest time, I had only ever watched the anime, live action and read the manga versions of Sailor Moon. I vaguely remember coming across a site talking about "Sera Myu" and not really understanding it and meeting an online friend that had briefly talked to me about them (he was a creeper so i didn't talk to that guy much...). Not long after I had joined GC and finished rewatching the anime, I was like "I should check out teh musicals" but i had no clue where to start. I know I picked one of the stars ones but I honestly cannot remember if it was Starlights Ryuusei Densetsu or Sailor Stars cause I watched both one after another to see the differences. Then I watched Mugen Gakuen and at some point tried to watch Dark Kingdom and lost interest for a while. Then someone joined GC that knows more about the musicals and SM than anyone I had ever met (some of you know who i'm talking about as she is no longer an active member here). She yelled at me and forced introduced me to the rest of the musicals and guided me through watching them all. After watching SuperS and Eien Densetsu Katieban Final Day, I was seriously hooked and the rest is history. My first Myu was Black Lady Kaiteban. I know this because I fell in love with Hikari the moment I saw her, hence my former username (HikariDemand). I just love everything about that Myu, while Marina Moon is nto my favortie moon, she did a good job for her first round of performances. I got into Myu through tumblr, which led me to GC which led me to livestreams. I had seen Myu on my dash and I no lie thought that looks stupid, I will never watch it, then when I stumbled on a live stream on tumblr almost 2 years ago, it was the end of a Myu, I am not sure which one, but Brit, Tsuki, my twin and other members were like show her Sailor Busters, and Pinky Typhooon, and they I watched more and more myus and I have seen them all now and I am a Myu addict and would reccomend all Moonies see at least one myu, give it a chance it is an amazing adaptation. Anza is my absolute favorite! Granted, I haven’t seen anything with Marina or Satomi yet, but of the three Moons I have seen, I find that there’s just no topping the original. She masterfully captures every facet of Usagi’s personality, from the goofy and sometimes bratty teenager to the despairing princess-turned-Senshi when all hope seems lost, and she has a wonderful singing voice as well. In every show, in every scene, it showed that she truly loved what she was doing, and that love seemed to bring out the best in all of her castmates as well. This isn’t to say that Fumina and Miyuki were no good. Hardly! I thought that Fumina really captured the “elegant” side quite well (especially when we saw her as Serenity), while I felt Miyuki really nailed Usagi’s exuberance and “cute” side. But Anza was able to do everything, especially at a point when the musicals were still starting out and they were still getting a feel for costuming, sets, etc., and that’s why she stands out for me above all the others. This is a hard one for me, its a tie between Myu and PGSM for me. I just love the storylines of myu, especially the original stories and I love the music in the myu, its just super unique and very fitting to the characters in this adaptaton. I want to see all the myu things and discover more myu things. I also want more people to love myu because it is awesome.